This book came into the library a little while ago and all staff were engrossed. 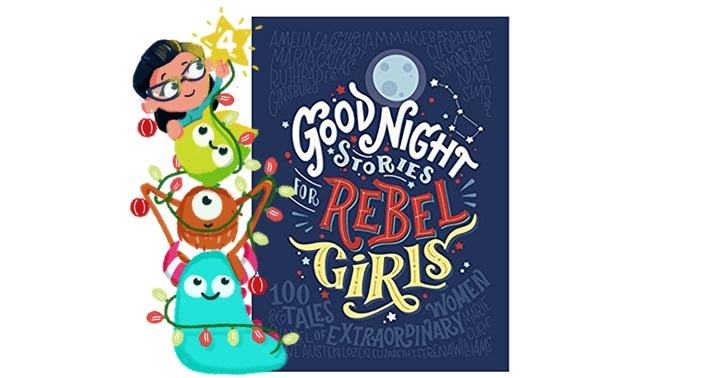 It is Good Night Stories for Rebel Girls by Elena Favilli and Francesca Cavallo and multiple illustrators and published by Particular Books. I had to include Goodnight Stories for Rebel Girls in my Book Monsters advent because it is really one of a kind. A unique and superb celebration of the most marvellous females in history. Ground breakers, inventors, explorers, artists and much more. Remarkable women, for numerous reasons, are recognised and talked about in this inspiring book. Each double page spread, consists of a female in history and tells their story, alongside an illustration of them. Each story is compact and brilliantly written, containing all the important details while making it the perfect length for a bedtime story, hence the title! The title is misleading though, yes it’s a great book for rebel girls, but also perfect for rebel boys and even the adult readers out there. We were all quite gripped by this wonderful book. Good Night Stories for Rebel Girls, is not only a fantastic advocate of females round the world, but it is an illustrative showcase. The pictures in this book have been beautifully illustrated by 60 female artists from around the globe. This is quite a remarkable book. Entertaining, utterly fascinating and beautiful to look at. Good Night Stories for Rebel Girls Volume 2 is excitingly due for release very soon!